EQuIS Facility Migration allows for easy facility migration between databases. To successfully migrate an EQuIS Facility, the following items must be consistent between the facilities. •The schema for each facility must match. •The Test Alternate Key must be the same for each facility. The Test Alternate Key is set when the database is created. •The data integrity must be consistent. •When a facility is migrated, a copy of the database is left in the original location, creating a new facility containing the original data in the target database. •Can only migrate between EQuIS 6 and later databases due to EUIDs. •Pre 6.4 databases need to have the ST_ID_MAP table added to their schema prior to migrating facilities from them. Contact support@earthsoft.com for standalone scripts to add this table to pre 6.4 databases. 1.Connect to the EQuIS facility where the data will be migrated. 2.Click EQuIS Facility from the Home EQuIS Ribbon Import section. 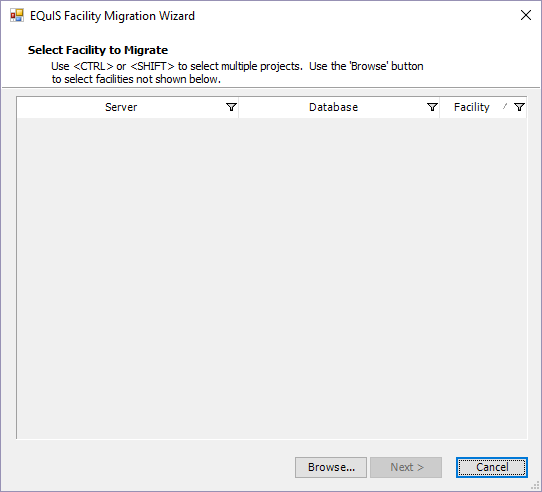 The EQuIS Facility Migration Wizard will open. 3.Click Browse and double-click to select a facility. 4.Click your Facility to select it. Click Next. To select multiple facilities, use <CTRL> or <Shift>. <CTRL>-click will highlight multiple facilities, while <Shift>-click will select all of the facilities in-between two selected facilities. Please note that you can add multiple facilities by continuing to click on the Browse button. 5.Click Next and select the check box for the options to be migrated. It is only necessary to migrate the Reference Values when migrating to a new database. If migrating to a current database, the Reference Values will already be set. In the case that you do not need to migrate the Reference Values, check the Data Tables box only. The time frame for migration is contingent upon the amount of data being migrated. Migration is most often complete within a few minutes. Some errors may occur when migrating. Once the migration has completed, choose to accept the migration (with any errors that may have occurred) or cancel the migration. The migration process is an Insert and Update process, which replaces existing records (except if new data is NULL, then it does not replace). This is important to note if migrating a facility to an EQuIS Database that already exists. Note: Not all tables are migrated. This tool omits certain system tables such as ST_* and XT_*. 1.Click Save in the lower-right or right-click anywhere on the data grid and select Save. 2.The error log allows you to work to resolve any warnings or errors by providing information about the given rows. 3.Open the error log where it was saved and view the data. The error log will provide general information about the data rows. If a warning is shown, the data was not migrated. Note that the facility migration code has been updated so that only action levels with DT_ACTION_LEVEL.FACILITY_ID populated will be associated with the new FACILITY_ID upon migration. If the FACILITY_ID is NULL in the source table, it will be left NULL in the new database. The "MigrateFacilitySkipTables" appSettings option in the EQuIS.exe.config (typically at C:\Program Files\EarthSoft\EQuIS) allows you to selectively skip tables during a migration. Multiple tables are separated by a pipe symbol "|". For example, the following appSettings will exclude DT_ACTION_LEVEL, DT_ACTION_LEVEL_PARAMETER, and DT_FILE from the migration process. The same setting can also be added to ST_CONFIG. The above ST_CONFIG table would produce the following modes when migrating. All rt_ tables would be migrated as Update; all dt_ tables would be migrated as Insert, except that DT_ACTION_LEVEL would be migrated as Update. The process described above will migrate data from the source facility to the target facility, regardless of where each database resides. The migration will download the data from the source database to EQuIS Professional and then upload the data from EQuIS Professional to the target database. This process works well when both databases are accessible via a local area network. However, if both the source database (containing the facility being migrated) and the target database are SQL Server Databases that reside in the same instance of SQL Server, then you may have better performance using T-SQL migration script. If applicable, the EQuIS Facility Import tool can automatically generate a T-SQL script that can be executed in SQL Server Management Studio. The script will use INSERT INTO ... SELECT FROM statements to copy data from the source database to the target database. The benefit of this approach is that the data is not downloaded to EQuIS Professional. Instead, the data is copied directly from one database to the other on the database server. The T-SQL facility migration script's INSERT INTO statements function as an INSERT ONLY commit type. The script does not perform INSERT and UPDATE as the Professional Facility Migration tool does. 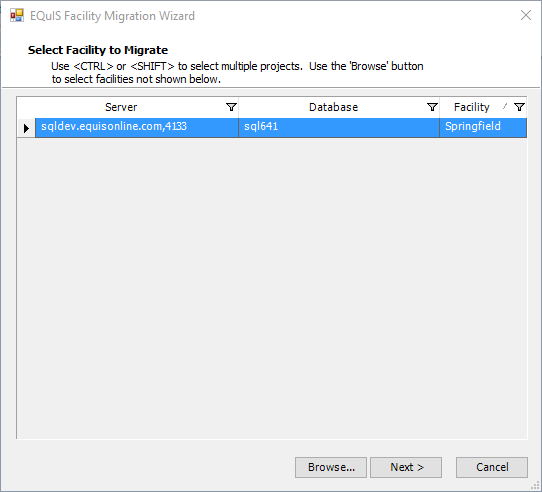 While the Facility Migration Tool has the option to create a T-SQL Script to be executed in SQL Server Management Studio (SSMS) for the migration of a facility, this option does not yet support Azure databases. 1.Log in to the EQuIS Database that the facility will be migrated to. 3.Click Add and select a facility. 4.Select the facility and click Next. 5.Select the check box for the options to be migrated. It is only necessary to migrate the Reference Values when migrating to a new database. If migrating to a current database, the Reference Values will already be set. 6.Do not click the Migrate > button. Instead, double-click the selected row in the grid. 7.When prompted, choose a path and file name where the SQL script will be saved. 8.Open the saved SQL script in SQL Server Management Studio connected to the appropriate SQL Server instance. 9.Execute the script to migrate the facility. ERROR: [table] is missing the euid colum [sic]. All tables must contain a euid column for the migration to run. The equis.add_euid procedure can be run to add the columns to all tables. Prior to generating the scripts, it is first necessary to ensure that the EUID column is present on all tables. This is done by running the following script on both the source and target databases; this process can be completed in SQL Server Management Studio (SSMS).